I'll be the first to admit that I tend to be a bit of a snob when it comes to denim. You'll only catch me wearing designer or 'it' brands, but hey, when you work with designer denim lines for 13 plus years, it's hard to not be addicted. I find that quality denim is well worth the money. Not only do they have a better fit, but they last longer, and since I wear jeans daily, the cost per wear makes up for the higher price tag. With that being said, I never thought in a million years that I would be wearing a denim jacket made by Forever 21. If a denim jacket didn't have the label J Brand or Rag and Bone, I wouldn't even give it a second look. But this one was staring me in the face when I was in the store last week, so I had to try it on. Not only is the denim soft, but the fading is in all the right places which makes it look like a designer denim jacket. Bravo, Forever 21, bravo! Looks like a great denim jacket! I love it with that fitted skirt on you! Ooh I'm in love with those flats! This outfit is so on point! I'm a denim snob too...especially when I'm so petite, I stick to the brands I know is tried and true. I did spot that same jacket at F21 too and almost bought it...great pick! I love me a denim jacket... and I love how you dressed it up!! Denim jackets can so SO hit or miss! I have a pretty cheap one, and I hardly every wear it because the fit is off. Makes me wish I'd invested a bit more in one! 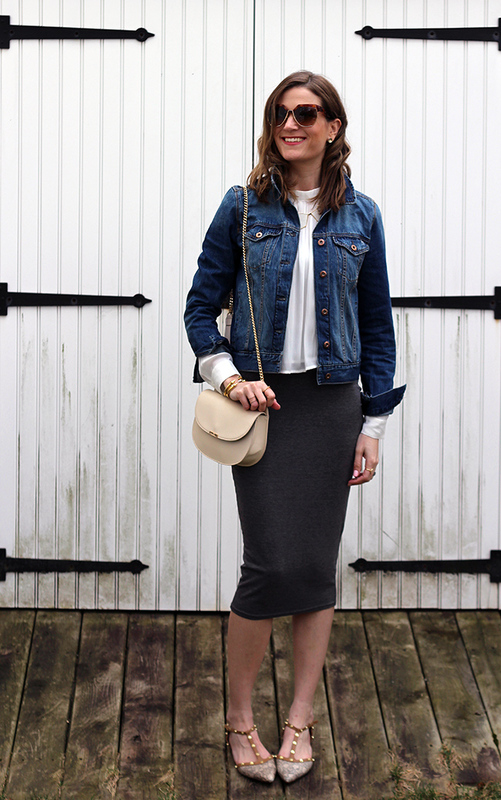 I love the combination of the denim + jersey skirt! I love when a F21 find is a great one! Love the jacket! This denim jacket looks like designer - great find! Loving this whole look! What a great look + I LOVE your style! 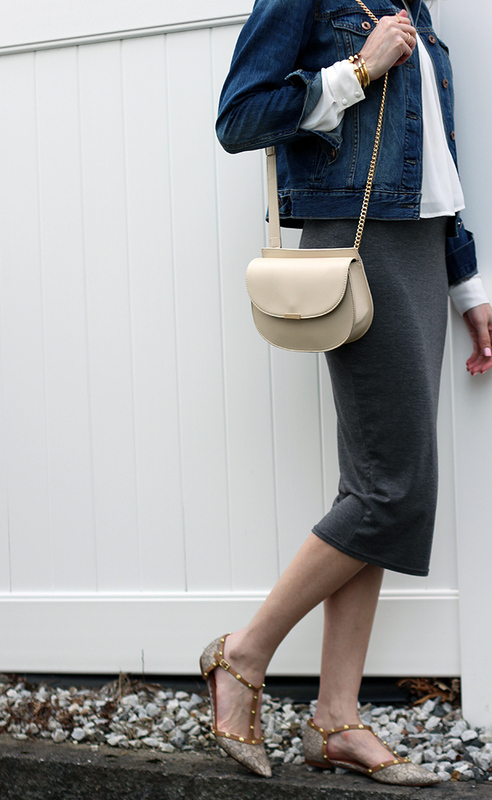 Such a cute casual chic look! In love with those flats! 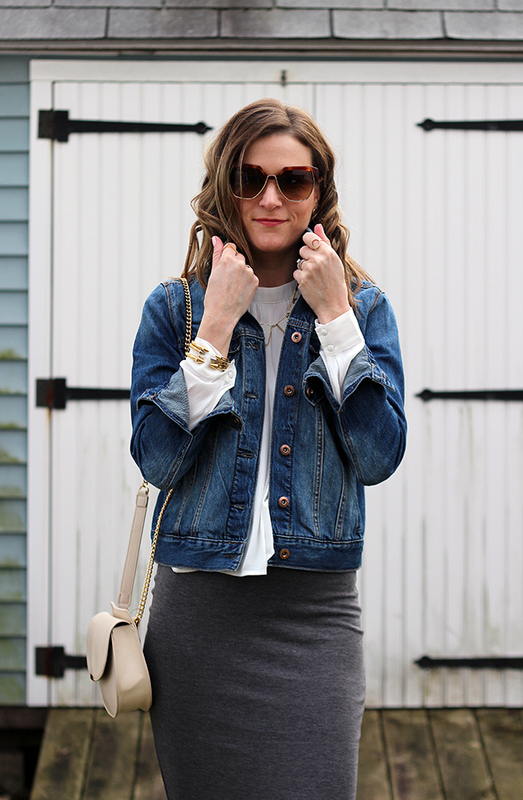 loving the denim jacket with the skirt! very cute! Seems like a great jackeT! Love the shoes, too. That looks like a great jacket! Love it styled with the pencil skirt! Those flats are amazing! What a chic outfit, and I'm having major envy over those adorable flats! I totally agree with you as far as designer denim goes with how it fits! Loving this jacket and I can't believe it is F21! Great look lady! I love the style and fit of your skirt! It is so flattering! F21 really does have some great stuff! You look so pretty! :) I found your blog through the link-up. Cute look! You are rockin' that skirt! I hear ya about the denim. I've just recently started branching out and there are some fabulous affordable pieces out there! A good fitting denim jacket is such a closet staple! I would wear this outfit exactly how you styled it. Looks amazing. A bunch of favorite pieces of my mine. The denim jacket looks great! I love the flats, too! Great jacket. 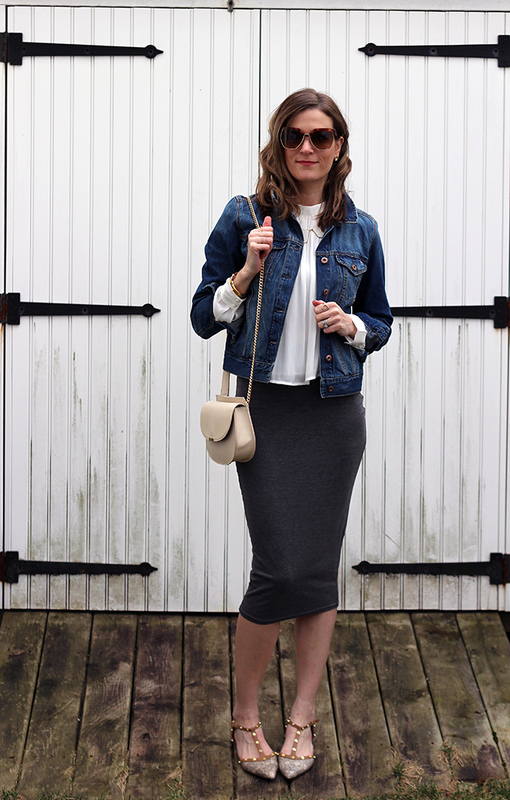 I love that midi gray skirt and need one like it. And I must say those flats and your bag are gorgeous - great prices too. My favorite faux leather jacket is from F21 as well and people always think it is high end. While I'm not normally a fan of shopping at Forever, they do have some hidden gems! Sometimes you are surprise what you find in places like forever 21. It looks great on you and the way you styled it. Loving your flats! Love love everything about this outfit, but those shoes are to die for! 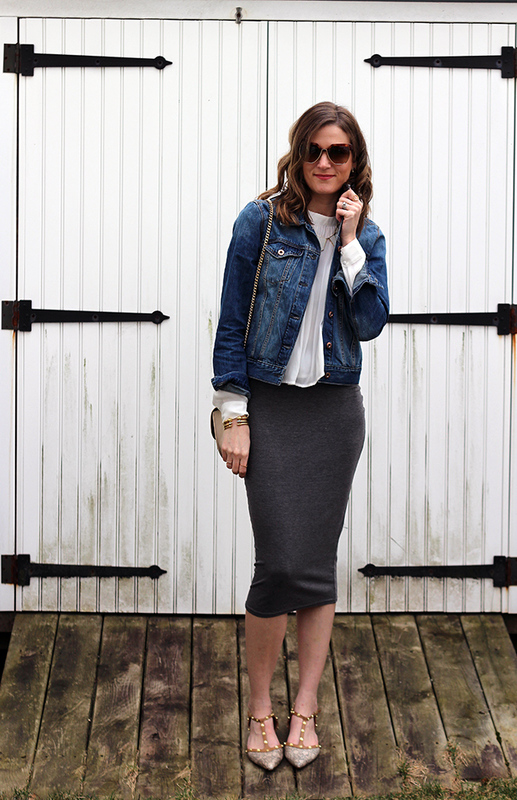 A denim jacket is a such a great closet staple, I own them in several washes. Love how you styled it!